This Side, That Side brings together graphic narratives on Partition by comic artists, writers, artists, illustrators, filmmakers, theatre artists and storytellers from across South Asia. Categories: Yoda Press, Fiction, History, Literature. Tags: 9789382579014, Bangladesh, Graphic narratives, Pakistan, Partition. The most decisive formative moment in modern South Asian history, Partition has remained a site of constant engagement, investigation and memory-making for over three generations. Over the years, Partition discourse has been shaped by prevalent politics, the use of faith for political reasons, a nod to nostalgia, a cocktail of facts and rumours laced with speculation, and the scholarly exchange of memories. This Side That Side marks a watershed, a generational moment of change in this discourse. 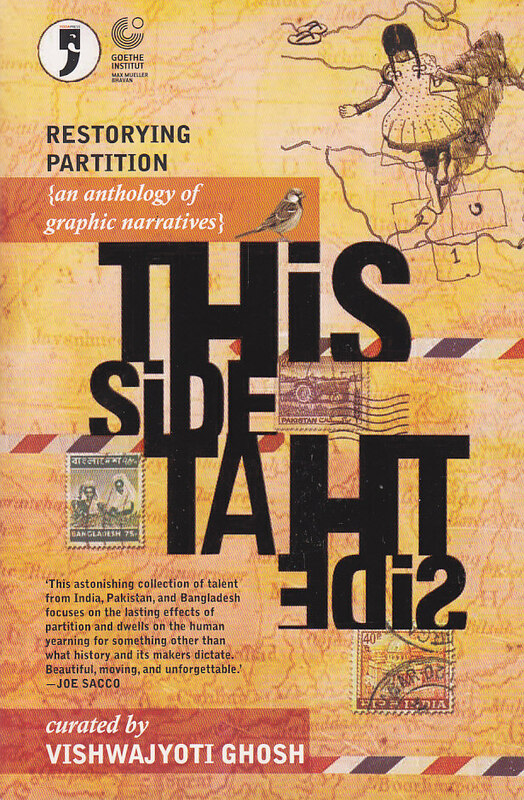 The anthology explores a dominant theme in contemporary South Asia—an enduring curiosity about the ‘other side.’ Poignant, contemplative, and often even playful, these narratives are creative explorations by those who may not have witnessed Partition, but who continue, till date, to negotiate its legacy. “This astonishing collection of talent from India, Pakistan and Bangladesh focuses on the lasting effects of partition and dwells on the human yearning for something other than what history and its makers dictate.